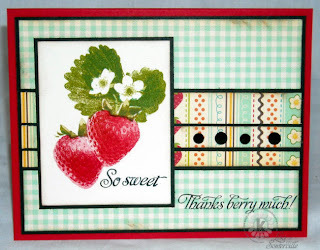 Happy Kitchen Sink Stamps Monday, thanks for stopping by today! I hope those of you on the East Coast are doing well after Hurricane Irene passed through and that you have no damage to your houses. This week I went for more of a CAS (well for me anyway) design, trying to keep my card to 10 minutes. Well lets just say it felt more like 10 hours! I ended up stamping the strawberry panel several times, either I'd end up with ink on my fingers or ink on the acrylic block that ended up where it wasn't supposed to be! Worth the effort, berry beautiful, as always! Very pretty, Lisa! The CAS approach almost always takes me more time than those with tons of layers and stuff! LOL!!! Beautiful masking with these gorgeous berries, Lisa! Love these delicate papers for your wonderful design! I'm with you on the smudges! I had to trim a few with the paper cutter myself today. Every 10 minute card takes 10 hours! Been there, done that! This card turned out lucious though! Beautiful delicious looking berries and perfect papers to showcase them! 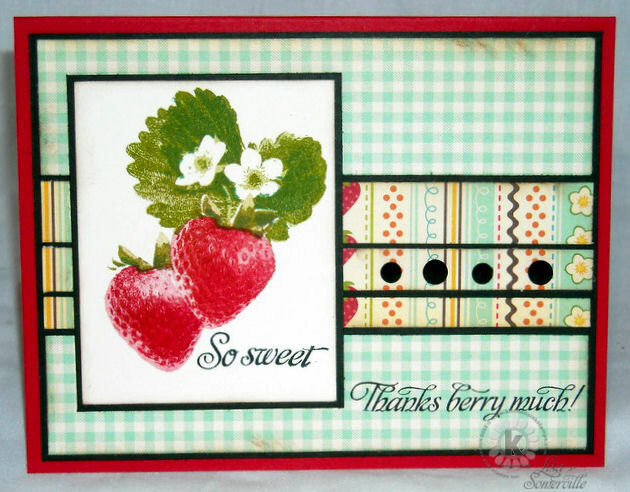 Love the gingham and those luscious looking strawberries, beautiful work. Oh Lisa! Your strawberries look sooo yummy! What a fun card! What a pleasant and fresh looking card Lisa!! Your strawberries are always so *berry* pretty!